Nirmitee Art Connoisseurs in Dadar is our favourite one-stop all for our quirky home decor collectibles and more with their collection of beautiful Indian handicrafts. 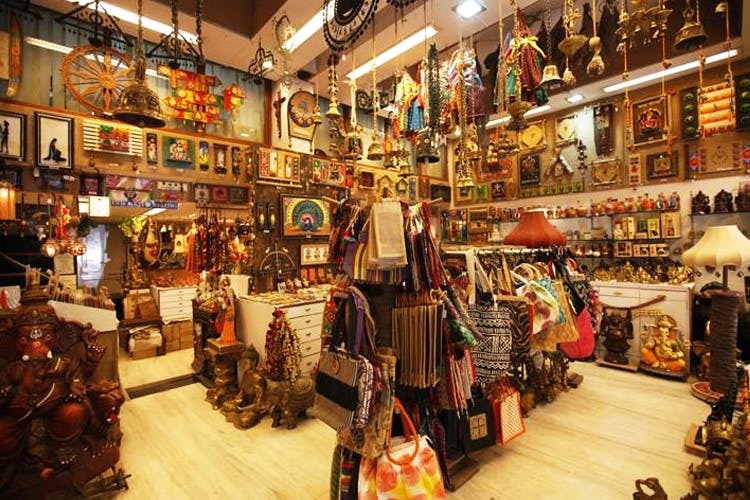 Nirmitee in Dadar is a beautiful shop and an art gallery that stocks and displays beautiful Indian handicraft items from across the country. The patrons can expect all sorts of traditional or even folk arts like the Warli paintings or Madhubani paintings from Bihar, Papier Mache shikaaras and bells from Kashmir, Kalamkari from Andhra Pradesh and more. They offer terracotta products, puppets and even Rajasthani-esque bags can be found hung around the shop. Once you enter the shop, you are immediately enamored by everything colourful around you. Though it’s definitely a luxurious home decor, one wouldn't mind shelling some moolah on these beauties especially because they make for perfect wedding gifts, something you will be remembered for. Nirmitee is to Mumbai what Delhi Haat is to Delhi. The prices, though on the higher end, start from INR 250 and go beyond INR 15,000 depending on what you’re looking to buy. We found a really eclectic set of bookmarks for INR 600 and a beautiful wooden Warli painting inspired wall clock for INR 600 again. They also have a handmade stationery set (INR 1,450) and beautifully made Buddha figurines in wood (INR 750) or bronze (INR 15,200) In fact, if you’re lazy and want to buy things whilst sitting at home, they also have a website for shopping. Though it features limited products on it, it offers a variety like we found terracotta clocks, bookmarks, coasters et al. Beware of your heart that is definitely going to take over your mind here. You are likely to find yourself splurging. We recommend that you fix a budget beforehand.